Why is Simple Radio Recorder offered for free for the first 30 days? I was not able to register within the first 30 days of free registration. Can you waive registration fee for me? Is this software compatible with Microsoft Windows 10? When I record sound using Simple Radio Recorder I hear noise (and/or recording is not clear). How can I fix that? I like this software but how can I make it simpler to set up recording schedule? How do I set SRR to record the same show every day automatically? I am recording an online radio broadcast and I need SRR to halt recording for several seconds. How can I do that? I would like to run more than one program (open more than one document and/or web page) when recording starts (and/or ends). How can I do that? Can I save a schedule I'm using for later? How do you set up to record from speakers (i.e. Stereo Mix) under Windows Vista or Windows 7? When I run Simple Radio Recorder I get an error message that says, "There are no recording sound devices found on this system"? 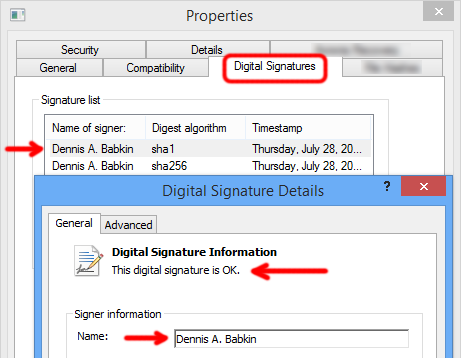 In case an executable file that "claims" to have been downloaded from our site does not pass any of the steps of the digital signature verification outlined above, DO NOT run that file and notify us about it! I'm not going to lie, it took some time & effort to make this software. At this point, we would like to collect some information from its users and also learn how we can improve it. That is why we're trading the information you provide during registration in exchange for a free license. (Having said that, we promise that the information you provide during registration will not be used for any marketing purposes or to send you spam! The information we collect is used only for our internal metrics.) So before we change our mind, take us up on it and register your copy. Because if you don't do it within the first 30 days, your free license will expire. Sorry, we cannot waive the registration fee if you missed the free registration period, or if you deauthorized your previous free registration. In that case consider donating to the work on this software by purchasing a paid license. Yes. Since version 1.2.6 the Simple Radio Recorder is compatible with Windows 10. Go back to the Options window and switch to the Sound Input tab. Adjust Rec Volume slider according to the quality of the sound that you hear. INFO: You will not be able to hear the result of your adjustment until you click OK in the Options window. Repeat this operation until the quality of sound becomes satisfactory. INFO: Try to avoid jarring noise in the sound by lowering the recording volume. Some sound cards allow sound input through several lines. Try changing sound input lines in the list above of the recording volume section. Go to Options, then switch to Sound Input tab. You'll need to adjust controls in the Quality section. The codec currently used by SRR is of a lower grade and does not support required recording quality. To see the current codec used by SRR go to Options and switch to Codec section. INFO: By default SRR will be using a system default mp3 codec. We recommend checking "Use default codec" option is default system codec does not produce a satisfactory quality of recording. The system may be low on memory, or hardware does not support selected rate of recording. INFO: Although many computers that were purchased in the recent years should not have a problem recording sound with SRR, some older models may experience problems. For Windows NT/2000/XP users: To see if your system supports rate of recording selected in the SRR, start a manual (or scheduled) recording, then switch to the Task Manager (by pressing Ctrl+Alt+Del keyboard sequence), then go to Processes tab and highlight the line in the list with SRR.EXE. Check the value in the CPU column. It shows percentage of CPU time used to process operation of the SRR. The lower this value the better. If it maxes over 60-70, you have an older system (it may be also caused by a "bad" codec). Later recording may lead to decrease in quality, loss of recording segments and software errors. In this case we'd strongly recommend lowering the recording quality. Open the SRR scheduler by clicking "Set Schedule" from the Main window, or by selecting Set Schedule if run from the system tray. Click Next and set the rest of the schedule. When done, but before pressing Set button, go to More, then Save As. This will open the saving dialog. Select an easy location for the save and give it a descriptive name. Make sure to select "Simple Radio Recorder files" in the Save As Type field. Then click Save. When back to the scheduler you may start the schedule by pressing Set button, or simply cancel out of it. Next time you'd want to set the same schedule simply double-click the .srrd file that you created above, or open up the SRR scheduler, go to More, then Open From File. Select the .srrd file that you created in the steps above and click Open. This should fill out the controls in the scheduler for you. Now all you have left to do is to click Next and then Set. Open the SRR scheduler and set your schedule as described in the method (1) above. When done setting the schedule (on both pages of the scheduler), go to More, then Save As. This will open the saving dialog. Select an easy location for the save and give it a descriptive name. Make sure to select "Command Batch files" in the Save As Type field. Then click Save. The steps above will create a DOS command line batch file that could be used to start SRR with the saved schedule already enabled. To do that simply double-click created batch file. IMPORTANT: To prevent confusion, it is NOT recommended to start more than one recording at the same time! Set recording schedule for one recording and save it in the DOS command line batch file as described in Q.7, method (2). The IMPORTANT thing is not to specify the date for beginning and ending of a recording. Find the batch file you created in step (1) above. Right-click it and select Edit. It should open in the Notepad. If present, make sure to remove the ID="<N>" part of the command line, where <N> stands for a number. (You may also want to edit the automatically generated command line. Check Command Line Help available from the program's Manual for more info.) In the Notepad go to File, then Save. Close Notepad. Double-click the batch file created in step (1) above. It should set the schedule. In case the Main window is visible, click Edit. In case SRR is minimized to the system tray, right-click its icon and select Edit Schedule. Click Next to switch to the Ending Event page of the scheduler. Put a check next to "Run the following file/program/web page", and specify the batch file created in step (1). For that you may want to click the "..." button on the right and select the batch file from the Open File dialog. Click More, then Save As. This will open the saving dialog. Make sure to select "Command Batch files" in the Save As Type field. Find the batch file you created in step (1) and select it. Then click Save. When asked if you'd like to replace an already existing file, answer Yes. Then close the scheduler by clicking Cancel, and stop the schedule by pressing Stop button, or Stop Schedule, if run from the system tray. The steps above will create a DOS command line file that will cycle SRR to record with the same schedule every day. To activate this process now simply double-click the batch file created in the step (1) above. Locate the batch file that you created in the steps (1-7) above and drag its icon first into the Windows Start button, then into All Programs, then into Startup folder and then when it opens up, drop it there. IMPORTANT: Do no release left mouse button while dragging the file link through Start button pop-up menus! Reboot your system and log in under the same user name to make sure that the SRR is activated and the schedule is set. Go to Start -> All Programs -> Startup and locate the file link to SRR schedule (it will be called, "Shortcut to <NAME YOU GAVE TO BATCH FILE>") and right-click it, then select Delete and confirm deletion. After you reboot your system the auto scheduling with SRR should be stopped. In the Starting Event window of the scheduler specify recording to begin immediately (you can do this by checking "After specified time period (from now)" and setting Hours, Min and Sec values to zeros). Also make sure that "Begin Recording" is checked and recording parameters are set correctly. Click Next and specify duration of the recording. Click Next and specify duration of the pause that you'd like to halt recording for. You can do this by checking "After specified time period (from wake-up moment)", and providing Hours, Min and Sec values to wait. Locate your document file in the Windows Explorer. In the Properties window right-click Location field value, then Select All, then right-click it again and select Copy. Then go to Edit and select Paste. A path for your document should be pasted after a double-quotation mark. Put in a single slash (i.e., "\") after it, and type in (or better copy and paste) the name of a document. Put a double quotation mark after file extension and hit Enter to put a new-line. If you want to add more programs/documents/web pages you can add them on the next line. Hit Enter to put a new-line. Then you can add another program/document/web page. - "<WEB_PAGE_URL>" stands for the URL of your web page. Make sure to enclose it in the double-quotation marks. where BATCH_FILE_NAME could be any meaningful name you want to call this batch file. Click Save. Now you may close Notepad. Back in the SRR scheduler, depending on whether you'd like to run all these programs when recording begins, or ends, check "Run the following file/program/web page" at the appropriate scheduler page. Specify the path for the batch file created above. An easy way would be to click "..." button on the right and select it using the Open window. Done! You may want to see if you programmed everything right by going to More -> Try running File/Program/Web page. INFO: This method does not support the use of the "Wait for the program to initialize" option in SRR scheduler. Yes. When setting a schedule go to File -> Save As to do that. You can later open it from the File menu, or by hitting Ctrl+O on the keyboard. For additional details please refer to Q. 7 above. Click on the Start button and then go to Control Panel. In the "View by" drop-down box select "Large Icons." Right-click somewhere in the free space in the list and check "Show disabled devices." At this point you should see Stereo Mix icon. If you do, right-click it and select Enable. To enable the Stereo Mix or Wave Out virtual device to record off the speakers output check the FAQ #12. When there's no sound card installed in the system. To remedy install a sound card.